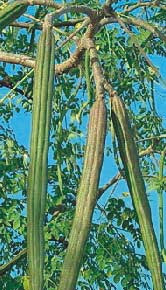 Medical plant kelor or(Moringa OLEIVERA)in the botanical name including herbaceous plant species that can have reach high rod 7 -11 meters. In Java, Kelor often used as a hedge plant because efficacious for drugs. Kelor tree is not too large. Trunk wood is brittle (easily broken) and the branch is rare but has strong roots. The leaves are oval shaped with the small size of the composite compound in one stalk. medical plant kelor can breed well in areas that have a height of 300-500 meters above the ground surface of the sea. Brass-colored flowers are creamy white flowers and green stem hood. Moringa flowers come out all year with a fragrant scent. medical plant kelor Fruit elongated triangular called klentang (Java). Being the sap that has changed color to brown called blendok (Java). breeding of kelor can by means of cuttings.